Let me help you have your wedding ceremony YOUR WAY. 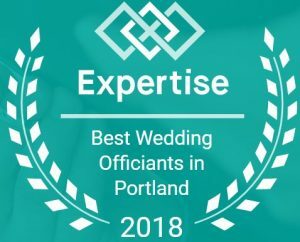 I work with my engaged couples to create wedding ceremonies that are unique to them, that tell THEIR love story, and that are warm, captivating, and memorable. Thank you for visiting my website. I’d love to talk with you about your wedding plans so that we can create a ceremony that is as perfect as possible for you. A ceremony that meets all of your needs, wants, and desires. A ceremony that is fun, elegant, romantic, practical, and as down-to-earth as you wish. 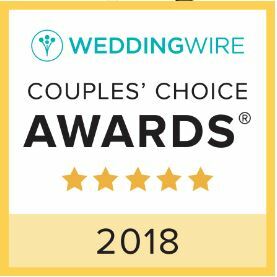 When you select me for your Wedding Officiant you can get an up-front planning session, ongoing consults, questionnaires and planning sheets, and a fully tailored script for your ceremony for a very competitive and affordable price. Plus I arrive early and can arrange for prior rehearsals. Traditional or contemporary religious and non-religious ceremonies, fun or romantic or both, are no problem and I’m happy to add custom elements as you desire. 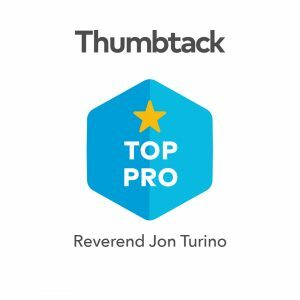 Click HERE to see the latest client reviews! Please see my Facebook page for some useful forms and other information in the “Photos” section. 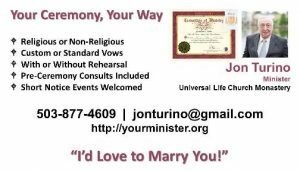 I also do Vow Renewal ceremonies if that is a service that you need. If you have questions or would like advice or referrals, please call, email or use my contact form. 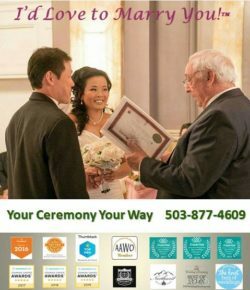 I can also help your friend or relative do a great job as your MC “officiant” at your DIY wedding ceremony. At no extra charge! Find out HOW and WHY here! 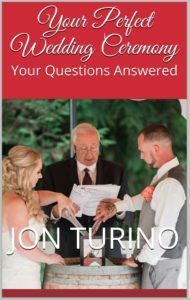 Don’t leave your wedding ceremony to chance in the hands of a non-professional! Book me NOW! Click the star to see a review from GigSalad! So glad we found him! Jon was amazing! Great communication and planning. Professional but personal. Great price. Prompt and prepared. He was such a great addition to our wedding day! Thank you, Jon! Highly recommend him! “I’d love to marry you!”. 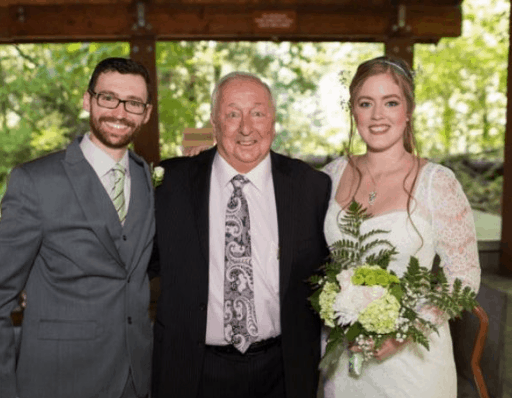 A simple ceremony only, using a standard religious or non-religious script, with a pre-ceremony phone or email script review consultation, is priced at $200. A tailored ceremony, with an in-person up-front consultation, help with customization or modification of the vows and script — a draft of which I’ll supply in advance for editing — is priced at $250. 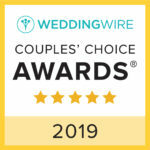 A tailored ceremony, with an in-person up-front consultation, help with customization or modification of the vows and script — a draft of which I’ll supply in advance for editing — and a semi-formal rehearsal, is priced at $350. 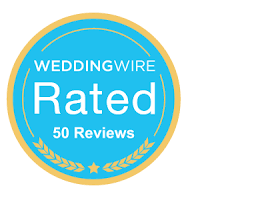 Rates shown above are effective 11/01/2017 for weddings within 25 miles of the Portland, OR, and Vancouver, WA, metro areas. Typically an extra $50 for >25 and <50 miles, and an extra $100 for >50 and <75 miles from 97230 (per trip). Please contact me for travel surcharges for other venues. A non-refundable $50 retainer via credit card is due when you book me in order to reserve your date. Your date is not guaranteed until your retainer has been received. The remaining balance is due 3 days prior to the ceremony and is non-refundable for cancellations occurring less than 72 hours prior to the scheduled ceremony date and time. 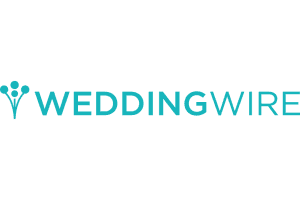 You can make your retainer or full payment using the pull-down menu and Add to Cart button below. 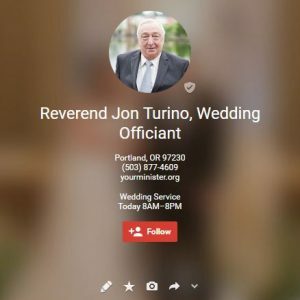 Please check my Booking Calendar or contact me by phone at 503-877-4609 or email me at jonturino@gmail.com before making a payment. Ceremonies that start more than 30 minutes late may be subject to an additional $50 charge.